A Flour Bouquet Cookie Gift Box is a great way to send a special gift for any special occasion or holiday! Our Premium Gift Boxes are hand packed with 12, 24, 36, or 48 of our delicious fresh baked gourmet cookies. 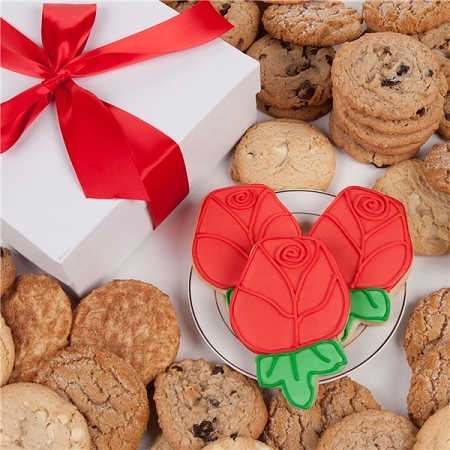 Our assortment includes our Signature Classic Cookies- Chocolate Chip, Oatmeal Raisin, M&M®, and Snickerdoodle- plus three of our famous Red Rose hand-decorated Sugar Shortbread cookies. Your cookie gift arrives in a gift box complete with a decorative bow. Copyright Flour Bouquet. All Rights Reserved.